Defending La Liga champions Barcelona will face the first real test of their title defence when they travel to the Vicente Calderon as league action resumes this weekend. It is the same venue where they sealed the league title last season.After two nervy 1-0 victories in the opening two games, the Catalans sit fourth in the standings – the same as their opponents. Despite losing some of their key players over the summer, Atletico appear a strong unit and have assembled a squad which is formidable enough to mount another title challenge this time around.As two of the top three title contenders go mano-a-mano in this season’s first crunch clash, we look at the combined line-up of stars from Atletico Madrid and Barcelona for this season. 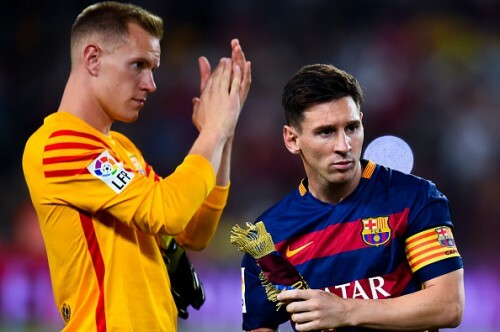 Having come up trumps to play a starring role as Barcelona clinched the Copa and the Champions League, Marc-Andre ter Stegen remains one of the best goalkeepers in the Spanish top flight at the moment. The German proved to be one of the signings of the season last term and will be the key in Barca’s quest to defend their titles. With Claudio Bravo sustaining a calf injury during international duty, the former Borussia Monchengladbach man is set to deputise for him and start under the bar for the first time in the league this campaign. Having been embarrassed by Athletic Bilbao in the Spanish Supercup last month, Ter Stegen’s credentials will be put to test again this week as he will be tasked with warding off one of the most rejuvenated attacks of the league. Barcelonas injury woes extend to the right-back position as Dani Alves is set to miss the vital game with a groin injury. 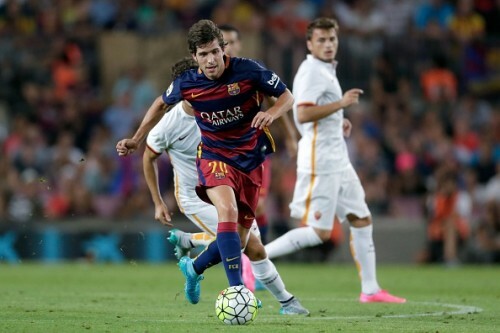 And replacing him in the backlinewill be the young and exuberant Sergi Roberto, who has been impressive in both the league outings so far. The 23-year old proved his worth with some compelling performances against Athletic Bilbao and Malaga, and is most liklely to start here as well. Roberto, this time though, will have a greater task at hand as he will be dealing with some proven quantities of the league such as Antoine Griezmann and the new arrival inJackson Martinez. 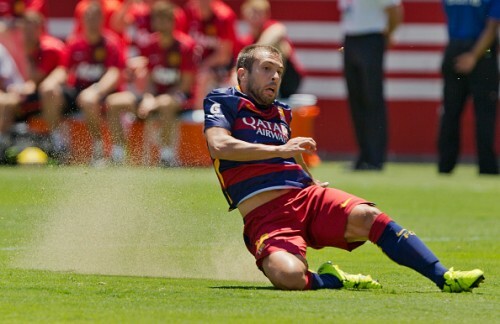 To the left of him will be Javier Mascherano, who was one of the most improved players of last season. 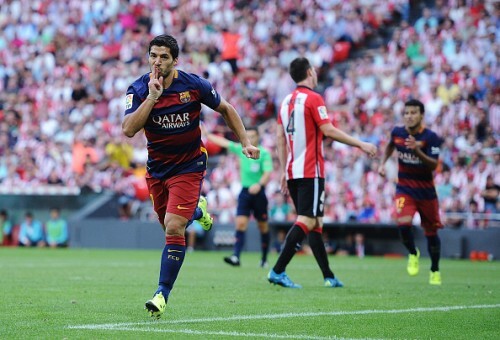 And although his performances this season have been erratic, he is still a pivotal player to the Blaugrana side. The Argentine, now in his fifth season with Barcelona, is an unbreachable bulwark on his day and will be hoping to conjure his peak form ahead of the crucial clash. Joining Mascherano at the heart of the defence in the combined line-up is Atletico Madrid skipper Diego Godin. The Uruguayan was one of the few shining lights in the Rojiblancos squad that failed to defend their hard-earned league crown last season and will be looked upon for direction and inspiration as his side prepare to launch another surprise challenge for the league title. Will Diego Godin have a say as he did when Atletico won the title? Completing the defensive back-line will be Jordi Alba, who returns to the fold after an impressive international break with Spain. The diminutive left-back contributed heavily in La Rojas successive victories at Oviedo and Macedonia, also being able to get on the scoresheet against Slovakia.Naturally, his confidence will be boosted as he gears up for another important excursion. Alba cut a frustrating figure in the initial few games for Barcelona this season and was run ragged by the likes of Sevilla and Athletic Bilbao. However, his encouraging showings in the international fixtures means that the former Valencia full-back is getting back into his stride and may get his wayward season up and runningwith another great performance at the Calderon. Can Jordi Alba take his Spain form into La Liga? Ivan Rakitic came in as a relatively unknown name but now stands as one of the biggest midfield maestros in Europe. The Croat, signed from Sevilla last year, was instrumental to Barca’s treble-winning campaign, showcasing one stellar performance after another. He also got on the score-sheet against Juventus in the Champions League final when he scored the fourth fastest opening goal in the tournament’s history. Expectations have naturally shot-up and Rakitic will be hoping to emulate his successful debut campaign into his second season as a Catalan player, as they look to retain titles on all the three fronts. 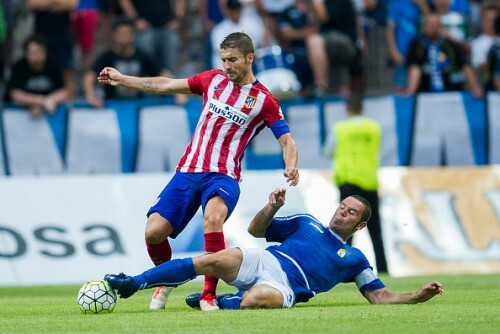 The midfield pivot will be occupied by Atletico’s Gabi, a highly talented defensive midfielder. The 32-year-old has been one of the keys to his side’s stoic defending, making them one of the meanest in Europe in the last few years. One of the best ball winners currently in the professional circuit, the Spaniard typifies the hard-running and counter-attacking game that manager Diego Simeone so astutely exercises from his team. Gabi will be vital in breaking the opposition’s team play and provide a great cover to the back four while simultaneously foraging into the final third to provide the extra edge in the attack. Atletico’s Koke takes up the remaining midfield slot. A pure Atletico Madrid product, the Spaniard has already stamped his authority on the team with his great creative influence and undeniable contributions in the attack. At 23, he’s one of the best young talents plying their trade in the continent and will be decisive to the Rojiblancos – as long as he stays in the Spanish capital. A versatile player with the ability to operate from the centre of the park or even from the right, Koke exudes great flair in his game and is also a prolific provider for his side. His assistance in the attacking vanguard will be Atletico's deciding factor in the game. 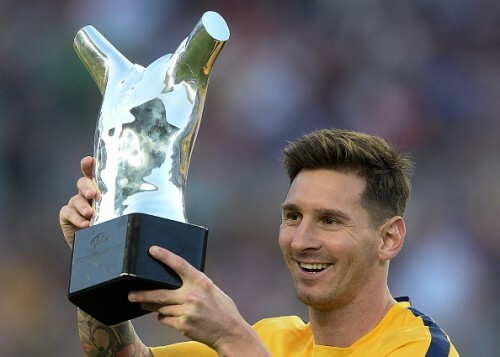 Lionel Messi has started off the season on good note, having struck a brace in the UEFA Supercup and a consolation goal in the 5-1 humiliation in the Spanish Supercup. However, he is yet to open his account in the league this season. The Argentine had a penalty attempt saved on the opening day and drew another blank on matchday 2 against Malaga. Now, returning to the scene where he sealed the league title last season with a late strike, Messi will be hoping to break his duck against an opposition he has scored thrice against in the last four meetings. Messi’s hat-trick against Atletico in 2011 is part of our Top 5 moments in the Barcelona-Atletico rivalry. 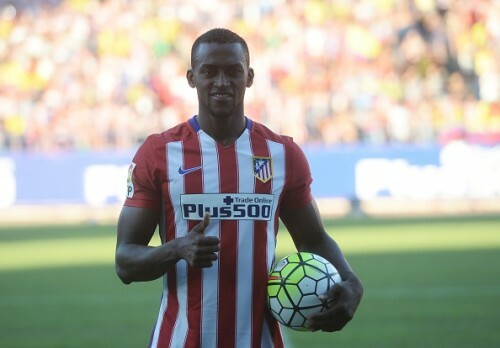 As Atletico Madrid lost their yet another striker when Mario Mandzukic was pillaged away by the mightier Juventus, they hit back strongly when they shipped in Jackson Martinez from Porto. The Colombian led the Portuguese league scoring charts and his magnificent scoring prowess meant he even helped his side to the quarter-finals of the Champions League, earlier this year. A proven goalscorer, Martinez brings supreme quality in the attack to his side and provides an outlet that rarely disappoints. His clever movements and an eye for goal are second to none and his accuracy with the ball at his feet is what sets him apart from his contemporaries. Martinez opened his La Liga account with a superb strike against Sevilla and will be looking to add another one against Barcelona. Luis Suarez made an excellent comeback from his World Cup woes as he was one of the staunch players to fire the Catalan club to the treble. And it seems that the Uruguayan has carried his rich vein of form to the new season as well. A perilous tormentor while also a sublime assist-maker, Suarez hit the top gear last term when he accrued 25 goals in 43 appearances. His technical ability and nimble footwork are something worth lauding. His direct running and clinical passing and shooting in the final third makes him an ace predator. The former Liverpool centre-forward, who already has two more goals this season, will be bearing the torch for his side up front and shoulder the responsibility of delivering the goods.